EM is yet another project from Michigan guitarist and electronic musician Jim Konen. I've heard Konen in a number of musical guises. There's the Detroit Improv Duo and MiWaPa Trio projects he did with Rotcod Zzaj. And then there was his VisionEar CD which is similar to what we hear on EM. Konen does an excellent job of drawing on Techno and World Beat influences, but spices them up with enough additional layers of fun to create music that will appeal to those who want a solid groove to dance to, as well as the more contemplative listener who wants some well thought out complexity to meditate on. Well... some of it would be tough to dance to. Tracks like "As Night Falls" set a cool groove but it's so deliciously off-kilter that rug cutters are likely to trip over themselves. But mixed in with the beats are ambient guitar licks that evolve into something almost trance-jazzy. And dig those cool bubbly alien synths. "That Funny Feeling" is similar in that it lays down a robotic electro pattern to which Konen plays tasteful jazz guitar with a cosmic spy flick feel. The contrasts are striking yet it all goes together so well. Other highlights include "Expedite" which consists of wild, groove driven electro patterns that are embellished by ambient textures and various freaky space bits. "Seance" features ambient dancey grooves with a bit of World Beat, quirky melodies, and plenty of trance. "Prelude" includes more of that ambient World Beat feel but is probably the most cosmically contemplative track of the set. "Goes Like This" has the beats that would most satisfy the dance-all-night rave crowd, though there is also more of Konen's dark ambient guitar as well as piano, and the freaky factor is just as high as anything else on the CD. Finally, "Crack The Whip" is my favorite track on the disc. Konen lays down his trademark freaky electro patterns and then lets it rip on the guitar. Very intense stuff. I'll bet this guy could easily do a rock guitar album that would make your eyes pop with his shredding capabilities. In summary, this is an impressive set of mostly electronic music that provides loads of grooves but offers lots of variety and creativity to give the discerning listener plenty to digest. And as with the VisionEar CD I'll draw the attention of Ozric Tentacles fans who also dig Eat Static. 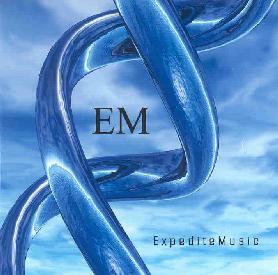 And while reviewing this disc I noticed on the CDSTREET site that there is a new EM disc out. Send it on Jim! For more information you can visit the EM page at CDSTREET at: http://www.cdstreet.com/artists/em. Contact via snail mail c/o Future Records; 23 W. Lawrence; Pontiac, MI 48342.